In an exciting Jr.welterweight fight that capped off Pacific Northwest Professional Boxing Promotions’ inaugural card on Saturday night at Harmony Hall in Olympia, Washington, Moldovan native Piotr Apostol (3-0, 1 KO), now fighting out of Renton, Washington, stopped Portland, Oregon’s Sean Gee (3-4) in the third round. The action got off to a fast start with both fighters engaging in the center of the ring and slamming each other with vicious shots in close. The early portion of the first was close, but as the round wore on Apostol found a rhythm, taking a half step back as Gee pressed and countering effectively with one-twos, giving him an edge. In the second round Apostol used his longer range to land from the outside and set up right hands with more regularity. Gee continued to press in the round, making for some exciting spurts of action, but Apostol controlled the round with the harder and more accurate shots. The third round quickly exploded into a wild back and forth brawl as Gee pressed with a sense of urgency and Apostol stood his ground, trading with his onrushing opponent. Both men landed hellacious shots early in the round, but about a minute into the round Gee made the mistake of dropping his hands to taunt his opponent. Apostol wasted no time in seeing this opportunity and unloaded with three clean shots to the exposed chin of Gee, the last of which buckled his knees. Apostol stunned Gee again with a right hook and, seeing Gee in trouble, unloaded wildly, leaving himself open. Gee, still firing back even as he took shots, found his mark with a hook in close and stunned Apostol. The intense pace of the round continued with both combatants wailing away, but late in the round Apostol began to take over. A flush right stunned Gee once again, prompting Apostol to pounce. After a series of vicious shots went unanswered by a wobbly Gee, referee Bob Howard made the call to stop it at 2:20 of the round. With the win Apostol adds his third victory to his pro record, his first by knockout. Gee suffers his forth loss in seven fights. Fundora and Gardner bang away. Coachella, California’s Alberto Fundora (8-0, 4 KOs) added another win to his unbeaten record with a first round stoppage of Daryl Gardner (2-8-1, 2 KOs), of Cheney, Washington, in the super middleweight sem-main event. Fundora went to work behind hard one-twos from the start, pushing Gardner back. Mid-way through the round a right to the temple dropped Gardner. Referee Terrance Moody waved it off after seeing Gardner on very unsteady legs. The time of the stoppage was 1:32. Ferguson, at left, loads up. Northwest amateur stand-out Patrick Ferguson (3-0, 3 KOs), of Spokane, Washington, added a third straight knockout to this professional record, stopping Pendleton, Oregon’s Justin Milani (1-3) in the second round. Ferguson, who in 2015 won the U.S.A National amateur heavyweight championship, had to make an early adjustment to his opponents long range offense, but by the end of the first round was countering Milani’s jab and landing heavy shots to the head and body. In the second round Ferguson’s body attack began to take its toll. Ferguson repeatedly opened up to the mid-section with thudding hooks, visibly wearing his opponent down. Late in the round, after a series of vicious shots to the body wobbled Milani, Ferguson unloaded with a debilitating overhand right, sending him crashing to the canvas. Milani gamely made it up, but after seeing him wobble, referee Bob Howard rightfully waved it off, giving Ferguson the TKO win at 2:30 of the round. Seattle, Washington’s Zach Cooper (4-2-2, 3 KOs) rebounded from a recent loss, stopping Colby Grayson (0-1), of Pendleton, Oregon, in the first round. Grayson, who was making his pro debut, came out firing with quick combinations, landing effectively early in the bout, but Cooper quickly picked up on his pattern and began rocking him back with stiff jabs. As Cooper picked up his output and began to land, the difference in skill level was evident. Grayson had no defense for Cooper’s attack. Late in the round Cooper dropped Grayson with a hard right to the chin, leaving him withering in pain on the canvass. Referee Terrance Moody called it at 2:34 of the round. With the win Cooper adds his first victory since losing to Andres Reyes last March. The bout was fought at the Jr. middleweight limit. In a four round middleweight bout between two fighters making their pro debuts, Renton, Washington’s Kevin Loyal (1-0) defeated hometown favorite Johnathan Arias (0-1) by unanimous decision. After a wild first round that saw both fighters land their fair share of leather, Loyal settled into a more measured pace, using his superior boxing skills to land the more effective shots and counter as Arias pressed. Arias was a game fighter and made it an exciting fight throughout, but Loyal had the edge in the majority of the fight with the more accurate punching. The official tallies read 40-36, 39-37, and 39-37. Welterweight Sean Quinnett (3-2, 2 KOs), of Spokane, Washington, made short work of Ellensburg, Washington’s Brock Eastman (0-1), stopping him at :55 of the first round. Quinnett, fighting out of a southpaw stance, opened up from the start with one-two’s and thudding follow up right hooks to the body. A right hook in close dropped Eastman on the seat of his trunks. As the action was allowed to resume, Quinnett ran across the ring at his opponent and unleashed a series of body shots that put him down for one last time, leaving him heaving on the canvass. 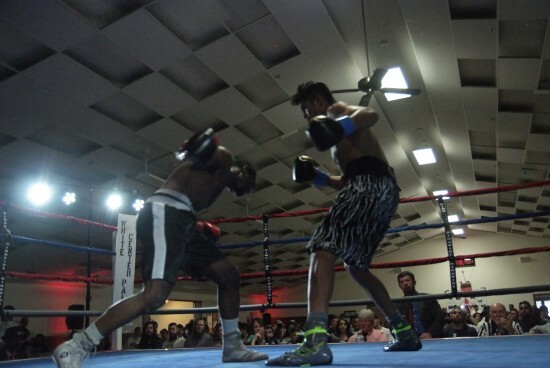 Referee Terrance Moody reached the count of ten, giving Quinnett the KO win. In the opening bout of the card, Portland, Oregon’s Ramel Snegur (1-0) made a successful entrance into the pro game with a clear-cut unanimous decision win over Niko McFarland (0-1), of Auburn, Washington. Snegur was the more technically sound fighter of the two and he used those superior skills to work at a favorable range with long jabs and straight rights to the body, countering with body shots and precise uppercuts in close as his opponent closed in. McFarland made every effort to mount a comeback, making the third round in particular a close one, but it wasn’t enough to overcome the slicker work by Snegur. The judges scorecards read 40-36, 39-37, and 39-37 all for Snegur. 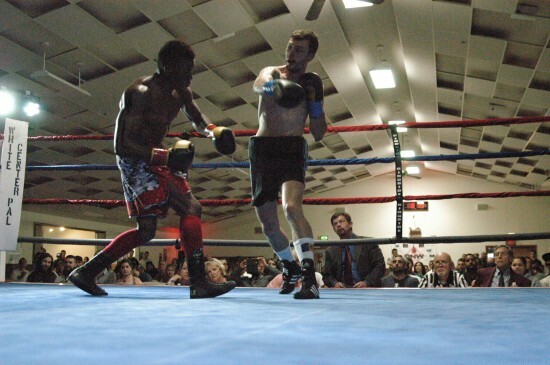 The first “Brawl at Harmony Hall” played to a raucous local crowd who came out to support their fighters. 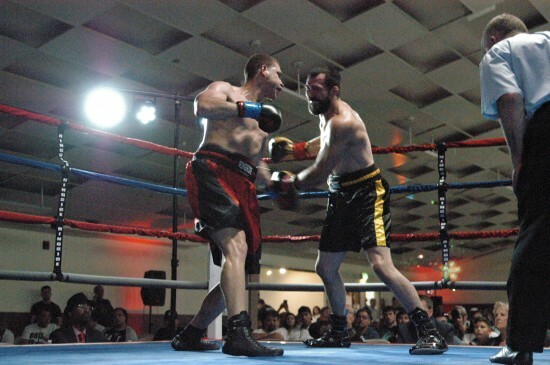 Pacific Northwest Professional Boxing Promotions plan on staging their next show September 24th.